Printing with movable type was the invention of John Gutenberg of Mainz about 500 years ago. One of the first books he printed was the Bible in Latin, the version known as the Vulgate, which had been commonly used in the Roman catholic Church for something like a thousand years. . . .
Gutenberg, like many another inventor, died a poor man; but the knowledge of his invention spread rapidly. . . . Those were the days when a new interest in the works of the ancient Greek and Roman writers was showing itself in Western Europe, and printing presses were set up in many cities to meet the new demand. At that time, most people who could read at all read Latin, [which] remained the language of the Church, and the clergy were able to make good use of the newly printed Latin bibles. In 1466 a printed German bible was put on sale at Strassburg, followed by another a few years later. These bibles in the common tongue were meant, we may suppose, for the common people; but the trouble was that few of the common people could read. Now it so happened that, a whole generation before Gutenberg, the art of printing drawings in black and white had reached Europe from China, where it had long been practised. 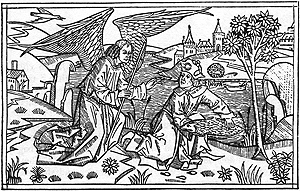 The process consisted of cutting into the surface of a block of wood, so as to show up the lines of the drawing in relief, then inking the block and using it as a stamp. . . . Before ordinary printing, woodcuts, as these block prints were called, were used to make whole books of pictures of this kind, and some on biblical subjects were helpful to the clergy in the instruction of their flocks. When new bibles in the common tongue were printed, a few illustrations to go with the text were particularly welcome. . . . The idea soon spread and in the two Bibles printed at Cologne between 1478 and 1480 the illustrations are a very special feature. They are . . . introduced at the right places in the text to tell their story most effectively . . . in order to make the text easier to understand and to give encouragement to the reader. . . . There is a manuscript bible in the Berlin State Library with pictures very like those of the Cologne Bibles, possibly by the same artist. His name seems to have been Cleve or Van Cleef. Nothing is known about him for certain, but an artist family of that name flourished in Antwerp a hundred years later. From the style of his landscapes it seems almost certain that he had lived in Holland or Belgium. . . . 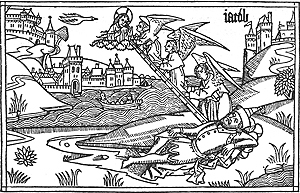 The Cologne bibles are of particular importance because their illustrations served as patterns for whole series of illustrations in later bibles in German, Italian, Czech (or Bohemian), French, Dutch and English, including the Great Bible of Henry VIII which came out in 1539. 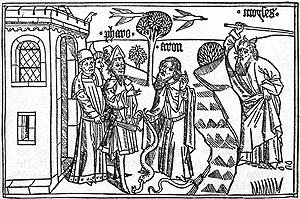 Before 1500, similar illustrations had been brought into Latin bibles as well. . . . In the early days of printing there was no protection for authors, artists, or their publishers. Illustrations could very readily be transferred from one book to another and a favourite set of drawings, such as appeared first in the Cologne bibles, was copied by other printers again and again. Sometimes the copying was far from intelligent and the illustrations that suffered in this way became more corrupt and less valuable as time went on. ; unless, as sometimes happened, the series was taken in hand by a real artist and restored to health and strength.